Winding down the twisting roads through the highlands of the Kangra valley, the sight that greets you about an hour before you hit Kangra town is breathtaking. Up north, the gentle swell of the rolling uplands suddenly come up smack against a high jagged wall that dominates the horizon. And it goes on forever, running in a long unbroken stretch from the east to the west, like a mythical barrier guarding some forbidden paradise. At an average height of 14,000 feet, the Dhauladhar range isn’t as big as the other Himalayan sub-ranges of Himachal Pradesh, but it is certainly one of the most dramatic. Rising up some 12,000 feet from valley floor to ridge-top, this serrated range looms over everything, clad in a thick coat of snow and ice that only relents in the monsoon months. It’s a sight that has enticed me for many a year, due to my frequent trips to McLeodganj, which has to be one of the nicest hill-towns within reach from Delhi. Hiking up to Triund, a grassy meadow high up on a subsidiary spur of the main range is something that everyone does, and a great hike though it is, its just the approach march to a great trek that leads you over the Dhauladhar range to the Ravi river valley in the Chamba district. Triund is where my fascination with this trek was born some two years ago, and it was only this year that I had the chance of going there. 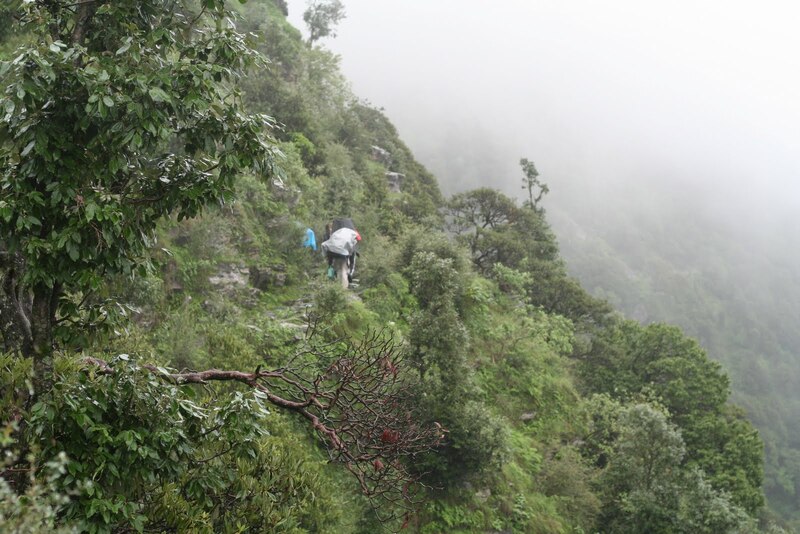 Monsoon is hardly the best time to go for this trek, and with the heavier than normal rains this year, we were told roundly by all comers that it was madness. However, two things were in my favour. My guides were of local Gaddi stock, the dominant community of much of the Chamba and Kangra region. Mostly traditional shepherds, they know every valley and pass around the Dhauladhar and Mani Mahesh ranges, which form their old homeland of Gadderan. The second was that one of my companions, Oli, was a trained mountaineer who had the experience of quite a few big expeditions. Brought together, these two factors played a big part in assuaging any fears I might have had. As we limbered into McLeodganj on a Monday morning, the signs were not encouraging. The Dhauladhar was cloaked in thick clouds and it was raining hard. In a way, it was better this way- once you’re soaked through, you pretty soon get used to the idea. The first thing to do was to meet Jagdish and Gulab, our companions for the next 10 days, so we quickly boarded an auto to Bhagsu, which lies a couple of kilometres above McLeodganj. Jagdish, a stocky, solid man with a shy, retiring nature and a faraway look in his eyes had been guiding in the area since 1979. His compatriot Gulab was a wiry 26-year-old father of two with ankles of steel; an irresistible charmer and an ardent believer in the powers of direttissimo– the most direct route over any obstacle. 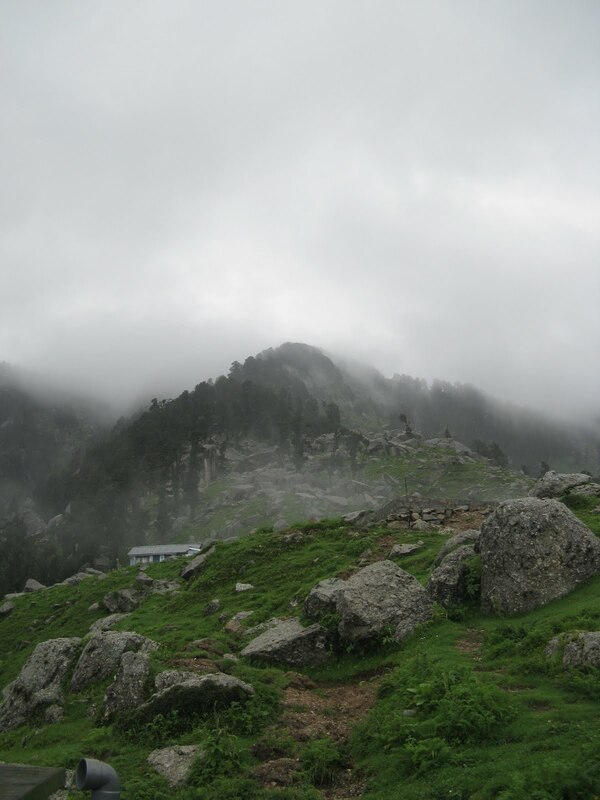 Although we had planned to stay an entire day at McLeodganj and re-pack our sacks and shop for fresh vegetables and other foodstuffs, Jagdish was of the opinion that in weather like this, we shouldn’t waste any time and make for Triund immediately, some 10 km and around 3,000 feet above us. We scattered in different directions for a last burst of provision shopping. A breakfast, numerous cups of tea and ruthless repacking later- where we discarded most of our extra clothes and other luxuries- we were off climbing steep country tracks through the resin-scented pine forest of Dharamkot. Since we could only start off at noon, the high sun had slowed the rain to a steady drizzle, although a thick ceiling of clouds still hung over the range like a shroud. 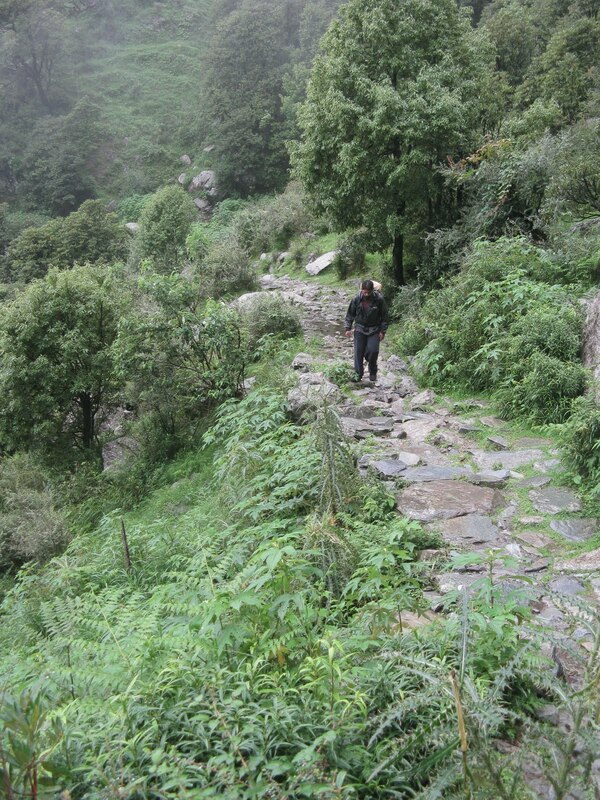 The path to Triund is one I’m very well acquainted with, but it was still a pleasure to walk up this steep trail, heavily laden though we were with 10-12 kg rucksacks and stopping occasionally for breath. To get to Triund, you climb up the Dharamkot spur above Bhagsu and then traverse the Laka ridge onto the Triund ridge, rising steadily all the time. 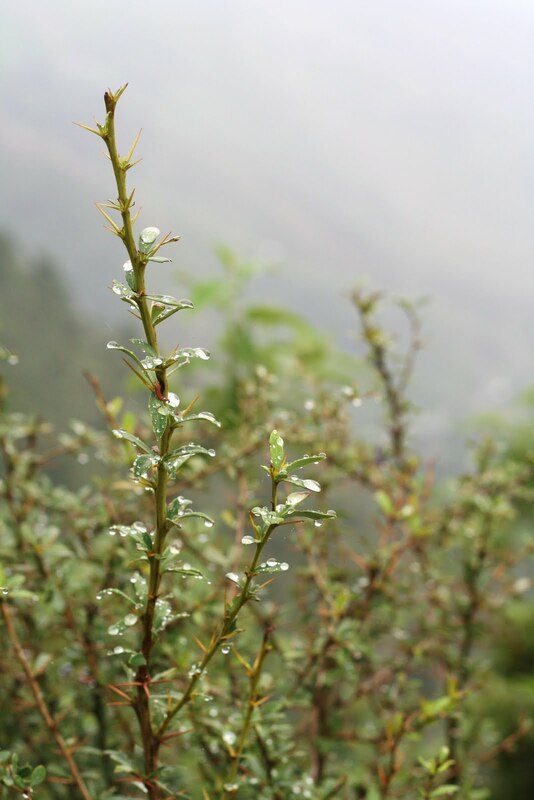 The southern slopes of the Dhauladhar are beautiful, but the mist and rain of the monsoon add just that right hint of mystery and elusiveness that makes the surroundings seem positively magical. Although I was a bit worried about weather conditions on the pass, I was certain that this approach march would be the most exhausting one, as our bodies got used to the steep gradient and the extra weight. We met familiar faces along the way. Anil owned a tea- shop aptly titled ‘Magic View Café’- though there was hardly any view to speak of right then- and welcomed me and KP (my other companion and another McLeodganj veteran) although he was a bit downcast. One of his cows had fallen awkwardly and had broken her back. A couple of cups of tea, a quick goodbye and we carried on through the deepening mist and intermittent rain up the final steep1000 feet to Triund. The track wound up between massive boulders and landslide zones, around and through carcasses of massive pines and rhododendron trees. Occasionally we’d have to jump over little rivulets, or wade through some mushy ground. I really struggled the final kilometre, stumbling up through the oppressive mist, struggling with the weight on my back and sweating profusely. Gulab, predictably, had reached a good while ago and came down to relieve me of my rucksack as I huffed and puffed my way up the final rise onto the green alp of Triund. The tremendous backdrop of the rocky south face of Mon peak was invisible in the threatening clouds, but as always, the soft springy turf of Triund gladdened my heart. The four tea shops that are a fixture here were busy with day-trippers and foreign tourists, though, thanks to the rain, the crowds that normally ascend everyday to Triund were absent. All I could think of was my intense sugar craving; I was lusting after sweet biscuits, anything really, to satisfy my sweet tooth and get some much needed energy. 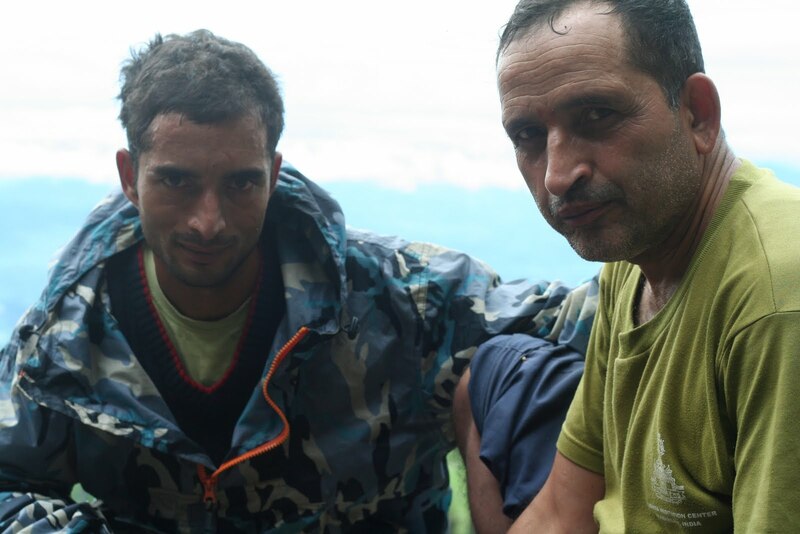 So while KP trudged off in the rain to say hi to Sunil, who owned the tea-shop on the southern end of the ridge, and Oli went off with Gulab to secure the old forest hut and get some tea going, I rushed into the nearest tea-shop and promptly devoured a packet of Hide’n’Seek. Feeling human again, I sloshed my way to the hut. 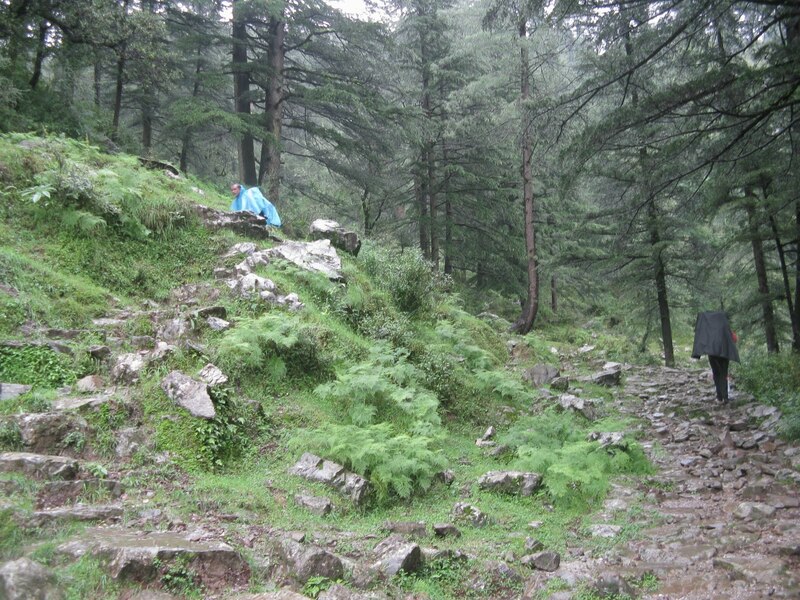 The Forest department runs a new bungalow on the saddle of the ridge which one needs to book from Dharamshala. However, just behind it is an old British-built log hut which is open for any happy camper that chooses to pass through. That’s where we camped for the day, glad to be finally dry, sipping hot mugs of tea around a smoky hearth-fire, while Gulab and Jagdish got busy preparing an early dinner. Thick clouds were passing over the ridge as daylight faded and it was raining incessantly. Below us, the Kangra valley was overrun with heavy blue clouds, though far away out in the valley, I could make out sundry Dhauladhar rivers like the Bhated nala making their way to the Beas. Above us was an unmoving blanket of dark pregnant clouds. Our plan was to leave the next morning for Lahesh cave on the main range if the weather cleared for a bit. There were, of course, many factors that we had to take into consideration. The first was acclimatization. If we hoped to do the Indrahar crossing the day after, then it was of paramount importance that we acclimatised as quickly as possible. At a height of 4350 m, the pass was one of the highest in this pass-riddled range, and to try and cross this very exposed ridge in this treacherous weather without acclimatizing was unthinkable. The second most important factor was the weather itself. We could expect a lot of boulder scrambles over the next two days and to do so in the rain wouldn’t be a good idea. So we had to move whenever the rains let off a bit. Accounting for this, we had kept a couple of days in hand for unforeseen breaks, but now that we were on the move, I didn’t really wish to rest. We turned in quite early after a hearty meal of khichdi and prayed for a clear dawn. Could you please advice on the agency you approached. Would you have any contact information for the two folks, Jagdish and gulab at Bhagsu please. Thanks! Lovely. Waiting for the trek beyond the pass. Saw Gulab of the Steel Ankles when he was rescuing two hapless Swiss kids from their tiny tents that were being lashed by hard rain. Was pine the only sort of resin scent around? Harman- I miss it too, already!Sanjiv- Thankee Captain. Sometime you've got to come back and do this properly. Nice one Bibek. Great stuff. keep em coming 🙂 sigh…i miss magic view cafe n tea-time with the dogs.